Choosing the best shaving cream is the first step towards achieving the perfect shave. Despite the fact that high quality shaving creams have been available for some years now, the majority of men still use canned shaving foams and other inferior products that are commonly sold in supermarket aisles. These shaving foams do a poor job at protecting your skin, and only help gliding the razor easier over your skin. A good shaving cream will not only do that, but will also soften your beard, protect your skin against nicks and cuts, and even help you restore your skin after each shaving session. In this page we will take a look at the best shaving creams for men on the market, so you can get the shave you deserve! Most people will need to shave during the course of their life. When it comes to shaving, regardless of location, the most important thing is to get a smooth shave all the time with a good shaver and shaving cream. 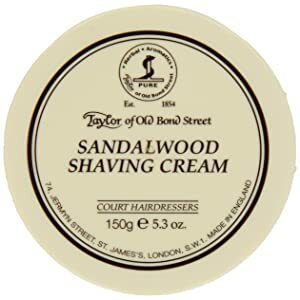 Taylor of Old Bond Street Sandalwood Shaving Cream is the best choice for shaving cream. This shaving cream give you a better shave by creating a uniquely smooth and creamy lather whilst protecting and moisturising the skin. Taylor of Old Bond Street Sandalwood Shaving Cream comes along with fragrant sandalwood smell, this shaving cream is placed on either the shaving brush or directly on the palm of the hand and then applied to the face, where the shaving brush is used to work up lather. 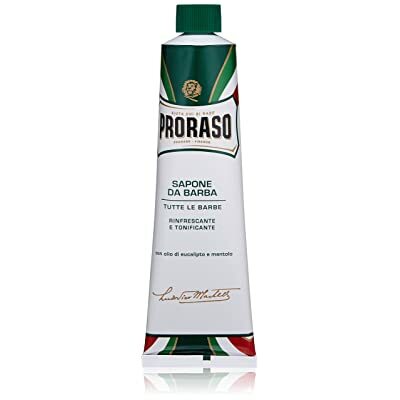 Proraso are the makers of this wonderful Italian shaving cream. The company has decades of experience making shaving cream and you can clearly tell when you use it. It’s one of those rare occasions where a product retains its quality despite being around for a long time. This refreshing shaving cream gives you a super close shave with minimal skin damage, and it does a wonderful job at minimizing irritation if you have sensitive skin like me! The menthol and eucalypt oil in its formula help soothing the skin while you shave and gives it a nice scent. Just a little bit of Proraso produces a rich lather, so you can use it with ease whether you use a brush or your fingers. This shaving cream is hard to find on stores, so get it online if you can. This is a premium shaving cream designed to help you shave smoothly with zero irritation. The Hydroplane is one of the most impressive shaving creams I’ve tried because it provides a high-degree of protection that is not found even in higher priced products. This cream won the 2007 Esquire Grooming Awards. It’s perfect for sensitive skin too and doesn’t contain alcohol or menthol. There are various benefits which one can get out of these shaving creams. They lubricate the skin such that the shaving blade slithers easily over the skin surface. It also protects the skin from nicks and cuts caused by sharp razors. Certain individuals have unstable hands, which lead to cuts and scrapes while shaving. But using the shaving cream brands available in the market enables them to nullify those minor cuts and nicks. When you apply shaving cream, the dense lather lifts the hair from your skin when coming in contact. This as a result enables the razor to cut those un-wanted hair off the skin surface and thereby giving a clean and smooth shaving experiences. Top-quality shaving creams have high concentrations of fat namely-natural oil. These oil concentrations safe-guards the skin in the form of a lubricant making it somewhat easier to glide through the skin surfaces and cut the hair only rather than the skin. Shaving cream contains refreshing fragrances thereby making the entire shaving experience appealing. Amazingly in some cases the smell is go good that one would simply skip the aftershave application. Shaving creams also increase the longevity of razors. When shaving making your hair stand up is essential to a smooth shave. When your hair is flat against your skin your shaver is unable to cut close to the roots leaving you with unpleasant stubble. All that’s required is the application of heat and your hair will stand straight and tall which is why some people shave in the shower. An often overlooked benefit of heat is that it softens your hair which makes your razors job much easier. Heating your hair before you shave it can save your from buying shaver after shaver month after month. Another benefit of shaving your hair when it’s soft is that when it grows back your skin won’t be irritated. I know for men this is a problem and I figured it might be a problem for you as well. If you have grown tired of the tugging of your shaver against your skin than a hot lather machine would benefit you greatly. Quite a few people shave as little as possible for fear of cutting themselves and the uncomfortable feeling they receive once they finish. Believe me, when you use a hot shaving cream dispenser this will happen a lot less and you’ll have a more comfortable shave. Did you realize that hot shaving cream cleanses your skin? Quite a few people don’t know this tidbit which can improve your skin quality greatly. More than likely your already clean your skin regularly but this can save you time by taking out one step from your daily cleansing routine. If your desire the smoothest skin possible and want to make sure that your skin is not irritated after shaving than having a shaving cream heater is vital. Heated shaving cream dispensers are small and unobtrusive and as a result won’t take up much room in your bathroom so theres nothing to worry about. All that remains for you to do is to pick out a hot lather shaving cream dispenser that you like which is why I’ve provided a few resources down below. To get started, I recommend you take a hot shower; this will open up your pores and let you shave without tugging or pulling. Alternatively you can wet your face and neck with warm water or using a warm towel. Now grab just a pea-sized amount of shaving cream with your fingers and apply to damp skin, massaging the whole area. Continue massaging the skin with your fingers for about a minute. This will help the cream get under the whiskers and give it time to act, softening your facial hair. Now your skin is ready to be shaved, use your favorite shaving razor and don’t forget to use proper technique! Start by wetting you brush using hot water, let sink water run on your brush for some seconds and then shake the excess water. Now grab your shaving bowl and add warm water. You’ll have to experiment with the right amount of water to get the right consistency. Grab the brush and swirl it around the shaving cream container without much pressure to avoid ruining the brush’s hair. Now take the brush to the bowl and start swirling the cream to mix it with the water. Keep on doing this for about a minute until you have built a rich lather. Once the cream is ready to be used, you apply it on your face with a brush, making circular motions to help removing dead cells and lift your whiskers.